Saying good-bye to our sweet Taz! So much for an uneventful weekend. I was going to name this post “Rest in Peace” and quickly realized that would have been a situation all in itself. 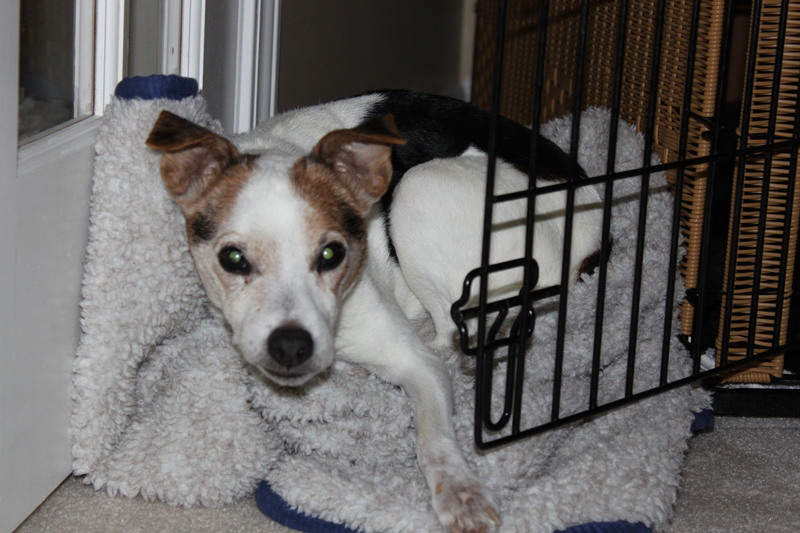 This morning we took our 17-year-old Jack Russell to vet to be put down. I have been a very strong proponent of not letting animals suffer and have kidded about this moment often. Never did I know it would be as conflicting as it turned out to be. Here was 17 years of my life that I was making a decision about. Man, I am glad that dog didn’t speak or, believe me, he would have had much to say. There would probably have been several Milk-bone bribes along the way. Even though he didn’t speak with words he always let me know where he stood with things. In his early years, I always knew when he was upset with me because he would take all the trash out of the bathroom and sort of “roll” my house. Never ate it or destroyed it but certainly made his point. Our last 5 months has taken as much a toll on him as it has all of us. 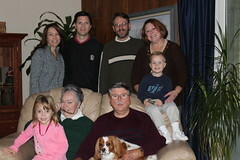 Each time there was a significant event such as us having to go out-of-town for Greg’s mom, his health took a dive. He then survived a week being boarded when we went to Disney, several days while I was in the hospital for my surgery and now Greg’s illness. I think the stress of life being completely upside down was just too much. He was looking really fragile the last few weeks and if you can believe it, he had a huge “mass” in his throat that was compromising his breathing. The best part of the story is that one of Greg’s deal breakers for relationships was dogs. I told him up front that Taz wouldn’t be around long… he was after all, over 10 years old when we met. As we lay in bed this morning knowing the probable outcome, I heard my husband weep for a dog he never wanted and who often made him crazy. I told him that he finally “had a pet of his own” since the both shared a tumor. Amazing how they get to you. I knew that it was time and Taz was ready because I felt peace instead of regret just walking out of the vet’s office. This isn’t a coincidence or another terrible event. It’s an experience of our life and journey. Taz made his mark on our lives. We thanked God for all the aggravation, annoyances, happiness and joy that silly dog brought. As I told my daughter to kiss him good-bye because he may not be coming home she seemed a little happy. She turned to her brother and said “Garrett, you know Tazzy is going to heaven and God is there. He is going to be good…”. Oh, the childlike faith. I loved hearing her say that. Thank you Taz for all the years. Good grief! Bless your hearts – and sweet Kate…what a precious outlook 🙂 I cannot BELIEVE Greg and Taz had a tumor. How strange! Sorry you had to do this this weekend, but glad Taz is resting in peace and in no pain. Im sure that must have been tough to say good bye to your dog especially since you have had him for so long. I admire your courage after going thru such tremendous trials recently.Obviously you all have done a great job teaching your children about Heaven. smiles I thought that was so precious when your little girl comforted Garrett. :-) Continue to be blessed and cherish each moment. Farewell Taz boy!! He will be missed…very well put Michelle. Love you guys. My goodness you’ve guys had a tough week….know that pain of losing a pet so well….praying for you guys and we love you. Sounds crazy but it is one of the hardest decisions most of us are faced with regarding our pets, and there is definitely something to that childlike faith! Give Greg a hug for me. Have a good Sunday, we have much to be thankful for, PTL. I am so sorry…I hate you had to make that decision but as you said, Taz is no longer suffering. Pets are such as big part of the family and love us unconditionally, I know this is hard. Thoughts and prayers continue to be with you…..Love you guys. Beautiful. You have the gift for writing – and may your sweet Taz rest in peace.